Prep your org for Event Monitoring Analytics and set user permissions. Describe the difference between permission set licenses and permission sets. 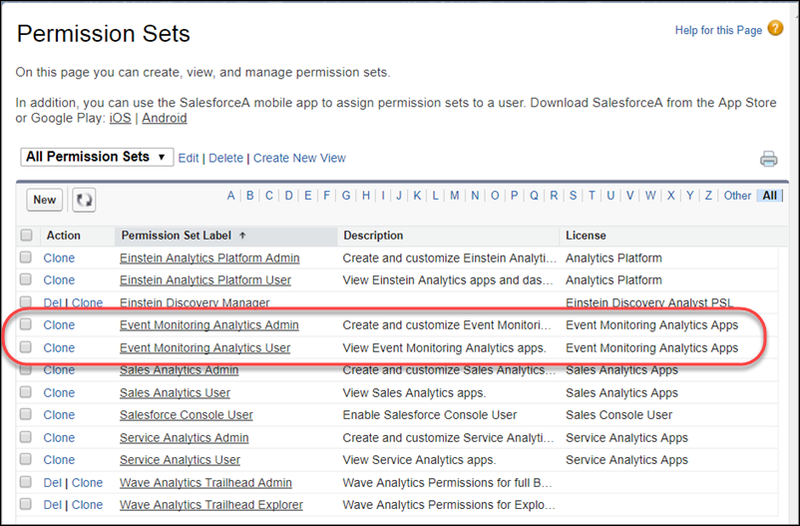 Use the configuration wizard to create the Event Monitoring Analytics app. Let’s get you going in your new role as analytics guru for DTC Electronics. You’re under a deadline to set up Event Monitoring Analytics so that you can talk to your CIO tomorrow about report download trends and issues. So, let’s learn how to quickly do that, and maybe have a little fun in the process. Your next steps: After enabling Event Monitoring Analytics in your org, you give other people access to it, and then you determine what they’re allowed to do. Ready? We’ve made it easy for you; the Analytics platform is already enabled in the Analytics Developer Edition org you signed up for in the previous unit. However, you’re first required to enable Event Monitoring Analytics in your org. Follow these easy steps. In Setup, enter Event in the Quick Find box, then select Event Monitoring Settings. Select View Event Log Data in Analytics Apps. Depending on your org configuration, the Event Monitoring Setup page can show additional settings, such as Enable Login Forensics. You only select the option in step 2. The org already has some active users. Yes—one is you! Another is Julie Chavez, your CIO. The account you’re using right now, set up specifically for this module, has complete admin privileges for that org. Your life would be so simple if that was the only account you needed. But in real life, you support the needs of many users, with various roles, each requiring various levels of access. Trailhead imitates life: Julie Chavez not only wants you to report on trends and issues in reports, but she wants access to the Event Monitoring Analytics app as well to see the dashboards herself. Give her permission to use Event Monitoring Analytics. Assign permissions to her so she has access to view dashboards. Not everyone can handle the awesome power of having access to all things Analytics. Let's assign a permission set specifically for executives—just enough to do what they need. You don’t want the CIO and other users to be able to do everything you can do as an admin. Analytics lets you control security at a very granular level for every Analytics app. So you’ll assign a permission set to make sure that the CIO has access to just what she needs to do her job. Here’s an analogy that can make things a little clearer. A PSL is like a passport. It grants you the right to travel, but you can't visit the great land of Analytics without the right visa. A permission set is like a visa. You can get a 3-day tourist visa, a work visa, and so on, each of which lets you do certain things. To do everything you want to do, you need both a passport and a visa, which is why you assign each user at least one PSL and one permission set. Luckily, there’s something called a standard permission set, which assigns the PSL and permissions at the same time. Let’s assign a standard permission set to Julie. Here are the sets you can choose from. For now, let’s assign the Event Monitoring Analytics User standard permission set to Julie. Later, if Julie needs more access, you can assign the other standard permission set. If you’re a permission set and PSL enthusiast, you’ll notice that Julie comes preloaded with a few assignments. In particular, she’s assigned to the Wave Analytics Trailhead Explorer permission set and the Analytics Platform PSL. Having these two assignments means that she’s also automatically assigned to the Event Monitoring Analytics User permission set. So why are we making you go through these unnecessary steps anyway? Because in the real world nothing is preloaded, and you’ll definitely have to make these assignments yourself. So let’s practice them now! Click the Event Monitoring Analytics User permission set. Select Julie Chavez and click Assign. You can always create your own custom permission set by cloning a standard permission set. You’re almost there! Time to jump in and create the app. If you completed the Analytics Apps Basics module, you used the fast basic creation option to create an app. This time, you use the custom option, which means you get to try out the built-in configuration wizard. As you work, keep in mind your goal: to get a working version of Event Monitoring Analytics so you have quick access to KPIs and metrics showing your users’ report download activity in your org. If you haven’t completed the Get Started with Event Monitoring Analytics unit in this module, go there first. In that unit, you sign up for a special Analytics Developer Edition org, which you must have to complete the rest of this module. If you’ve previously set up a Developer Edition org for another trail or use a Trailhead Playground org, it won’t work with Event Monitoring Analytics. Click Create and select App. Click Create App from Template. Select Event Monitoring Analytics App, and then click Continue. In the Event Monitoring Analytics App - Personalize wizard, otherwise known as the configuration wizard, select the amount of data you want to include in your app. Each dataset corresponds to one or more prebuilt dashboards. Since we’re going to focus on reports, we want the maximum amount of data possible for datasets: 30 days. So we choose 30 days for the Report and URI datasets, and accept the default values for all other datasets. On the Step 1 of 5 page, click Looks good, next without making any changes. On the Step 2 of 5 page, change the number of days of Report data to 30, then click Looks good, next. On the Step 3 of 5 page, change the number of days of URI data to 30. Click Looks good, next without making any other changes until you reach the area to name your app. Name your app Analytics for CIO and click Create. This takes a few minutes, so grab that cup of coffee, watch cat videos, or whatever you like to do to pass time. Soon, you’ll receive an email stating that the dataflow ran successfully, and you can move on to the next section. You just created your Event Monitoring Analytics app. Congrats! 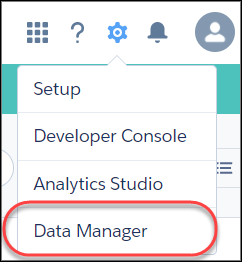 Now it’s time to run the Trailhead Event Monitoring data manager, which brings the right data into your app so you see meaningful data in dashboards. In the real world, you never have to do this when you create Event Monitoring Analytics with your own license and schedule the dataflow. So we invite you to blast through without thinking about it too much. 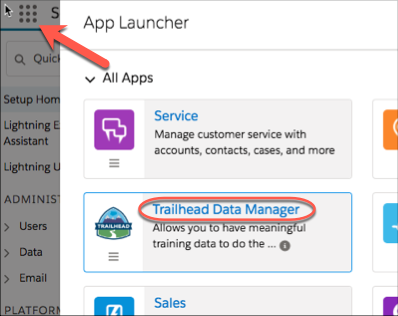 From the App Launcher, select Trailhead Data Manager. On the Trailhead Data Manager home page, click Trailhead Event Monitoring. On the Trailhead Event Monitoring page, click Get DTC Electronics Event Data. 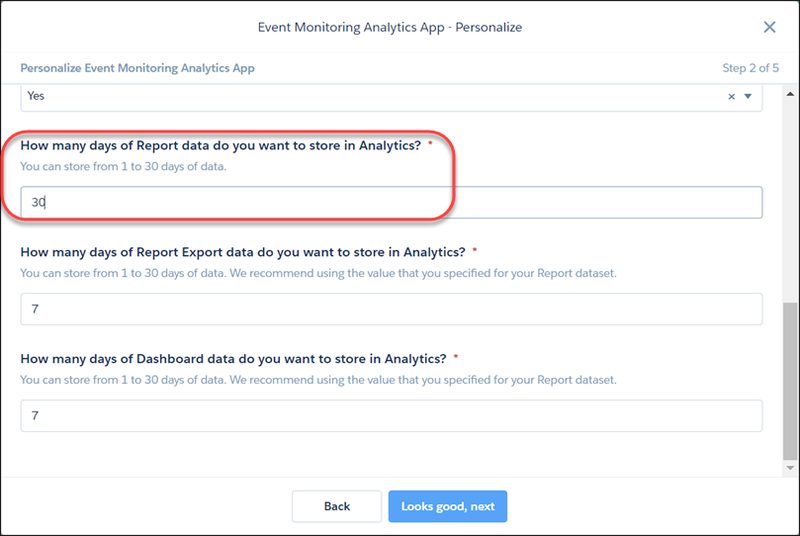 After the data is uploaded successfully, you’re ready to create the Event Monitoring Analytics app. From the App Launcher, choose Analytics Studio. If you don’t see a message in the expanded list in the Analytics for CIO item, you can refresh the page to get it to appear (it can take a few minutes). Once you have the message, it’s time to check out your first Analytics app. Don’t worry if the status is Warning. You can still use the data. Way to go! You have your first Analytics app—and you did the Trailhead-only steps to make it into a realistic playground—extra “Bravo” for that. Now let’s see what all the excitement is about. From Analytics Studio, click the Apps tab. This is where you can go to see all your apps. And now, the moment you’ve been waiting for. Click Analytics for CIO, and…voila—the app opens to its dashboards. To ensure that your dashboards have the latest data, refresh your browser. Your dashboards reappear with current data. We’re not going to linger here—you can learn more about Event Monitoring Analytics dashboards in the next units. For now, check all that you’ve learned by taking the challenge quiz. By the way, in a real-world situation, the Event Monitoring app comes with sample data (1 row in every dataset).